The desire for carpet mainly rugs is eroding. While it does keep the feet warm in winter, many especially parents with children, can no longer deal with the headache of vacuuming. The dusts, germs and contamination associated with carpets are making some to dump the idea. Those seeking relief have turned to hard wood floors but to their disappointment, wood floors are not only expensive to install, they too need constant maintenance and polishing to keep the quality, so what is a better alternative? Many are now turning to the old way of flooring. Tiles are fast becoming the trend with people all over Europe, Africa and now the Americas looking to tiles as the best option for their floors and wall decoration. Among the reasons for such change is the fact tiles are easier to clean or maintain. They are designed to your taste just as you want it and not only that, they come in different colors that would make your home unique and incomparable to others. One company that is now making name for supplying the best tiles for homes, restaurants, hotels, bars and offices is Demosaica a tile maker in Seville South of Spain. At Demosaica, a customer can choose from different designs that comes in the most beautiful colors you can think of. Demosaica is only one of few tiles’ manufacturers in the world that allows its clients to customize their own design to suit a particular taste or task. Unlike other manufacturers, that the design you want is unavailable, is not an excuse not to supply what you need, you can design the tiles you want on the website and the company’s team of expert will produce the tiles exactly to your taste. At Demosaica each piece is manually crafted individually, using the same technique pioneered by Arabs over ten centuries ago and with the discovery of hydraulic presses and Portland cement, the company now makes cement tiles as they are known today without the use of clay or heating. At first, decorative tiles, popularly known as encaustic tiles, were made from pigmented clays base, then heated or fired in a kiln. Tiles manufactured by this method were very popular in Europe, Latin America and the United States. Mosaic tiles Encaustic paving were manufactured and used traditionally since the late 19th century throughout the Mediterranean. They became the choice for flooring and walls in countries like: France, Portugal, Spain and the European colonies in North Africa and Latin America. Each is individually crafted using old technique pioneered by Arabs centuries ago, but this would later change with the development of hydraulic presses and the appearance of cement tiles in the late 19th century. At the turn of the 20th century, cement tiles were well-known in the United States, as high-end floor covering. Such tiles got installed in many landmark buildings and palaces in Europe but with the arrival of new methods of flooring, including carpets and wood floors, the popularity began to wane in the U.S. between the 1920s and 30s but they’re now making a comeback as people realize the uniqueness and sense of taste they add to a home or establishment. This is why many are approaching Demosaica, a company in the third largest city in Spain, for their supplies of the best cement tiles in the market. Demosaica makes its tiles by hand, using a mold, mineral pigment, Portland cement and fine aggregate with electric hydraulic press for better quality. There is no glaze or kiln as their tiles, are cured by water and air only, just like in ordinary cement. The metal mold with the desired pattern is individually made by hand choosing from different drawing patterns. The pigment composition uses high-end Portland cement, fine sand, marble powder and natural mineral color pigments. To prevent inconsistent pattern and damage to quality of its products, Demosaica, uses electric-powered hydraulic presses, for a firmer and stronger pigment layer embedded in the cement layer, for tiles that can last a lifetime. Mineral based pigments are also used to avoid the wear and tear usually associated with non-mineral based pigments known as the reason some tiles fade with age. Cement tiles are becoming popular around the world in homes and commercial establishment. They are found in most homes in Europe and though, they are making a comeback in the United States, there are no known manufacturer in the U.S. to satisfy the demand. Many seeking unique flooring are now faced with the problem of finding titles that would meet their needs. Reputable builders and home designers have certified cement tiles as good for homes, offices and other flooring and wall design needs. They are durable and the vibrant colors and ornate designs are reminiscent of ancient floors, but how do you find one that meets your need? 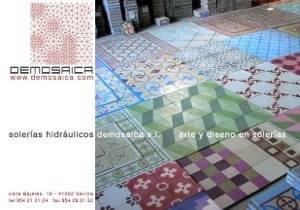 The answer is in Europe and the company is Demosaica, a tile manufacturer in Seville Spain.